The stock market is off to a record pace this year. The S&P 500 Index shows that it has surged more than 10% in the first three months. It continues to climb. To put that into perspective, the average return for the S&P 500 is just 10% for an entire year. With the market already climbing more than 10% in the first three months, many assume that the next nine months will underperform. This pushes the notion that these gains are not worth chasing. Or that it’s best to ignore the rest of 2019 and wait for 2020 for better opportunities. But according to a little-known seasonal trend, this is the year you can bet on above-average returns. The 10% rally is just the beginning. The rest of the year promises even bigger returns. 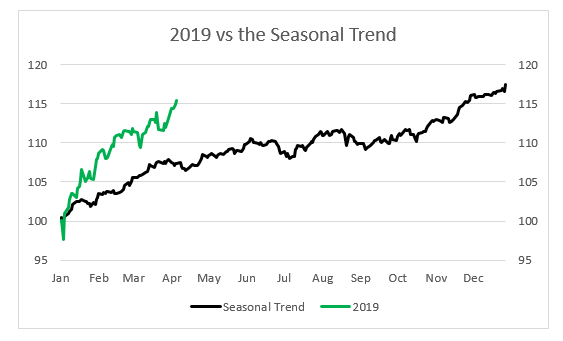 One of my favorite areas of study in technical analysis is seasonal trends. These trends give us an idea about what to expect from the upcoming months based on historical price movements. The thing about seasonal trends is that we don’t know why they occur. But they show up time and time again, and they give us a strong reference on what to expect. The one seasonal trend telling us 2019 has yet to see its peak is the Presidential Cycle. To learn more about this seasonal trend, check out my YouTube video below. And click here to go to my YouTube channel, and hit the subscribe button to be notified when I post a new video. As the name suggests, this is a seasonal trend tied to a president’s cycle in office. With the uncertainty in all the headlines, it’s easy to get caught up in the hype from one year to the next. But this cycle ignores those headlines and focuses on how past presidents have performed during each year of a U.S. president’s first four-year term. And the third, President Trump’s current year, holds the best returns of them all. Take a look at the chart below. 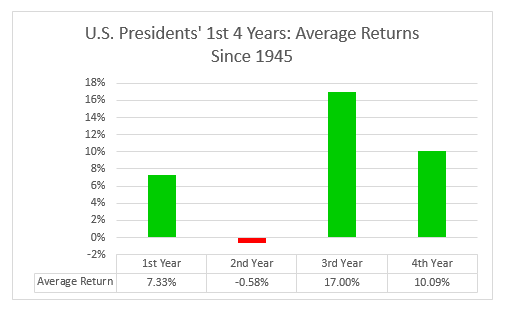 It shows the average return since 1945 for a president’s first, second, third and fourth year in office. Since 1945, the third year of a president’s first term in office has averaged a 17% return. I start with 1945 because when it comes to presidential cycles, this is the first four-year term with term limits. It also avoids the boom-and-bust period of the Roaring ‘20s and the Great Depression. Since then, our economy has been more stable. This gives us a better idea of what to expect under current presidents. Each year has its own unique seasonal trend, but this third year has consistently been the best. It only has one negative return in the past 11 first-term presidents. Under former president Barack Obama, we saw a 1% loss. Prior to that, the worst year was 1947, with a 1% return. Every other third year has produced returns of more than 10%, and as high as 34%. That’s why I’m still bullish about the gains we’ll see this year. The green line shows the market’s performance from the start of 2019. The black line is the seasonal trend for a president’s third year. You’ll notice that even though the first three months are climbing faster than expected, they are still trending in the expected direction. That will continue throughout the end of the year. This is a great year for investors. It has a 10-to-1 win ratio — going back to 1945 — and a strong double-digit return. So far, the average return is 17%. But as I mentioned, this is the year to expect outsized gains. We have seen returns during a president’s third year top 10%, and many were above 20%. That leaves us plenty of room to continue climbing in 2019. There’s no reason to get spooked by the strong start — there are better gains ahead in 2019.